Esther Gili (Madrid, 1981) has been drawing for as long as she can remember and enjoys interpreting the world in her own way. She studied Illustration at the Escuela de Arte nº10 in Madrid. Since then, she has worked as an illustrator for several publishing houses and regularly collaborates with USER T38, producing illustrations and storyboards for film and advertising. 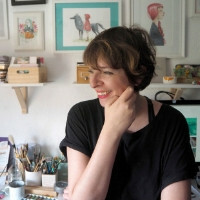 She has received numerous awards for her comics and illustrations such as the INJUVE and Young Creators of Madrid prizes. She is the author of 39 semanas y mis experiencias como madre novata (Lunwerg) and El lenguaje de las olas (El Astronave), among other exquisite picture books for all audiences.